On January 15th, the unveiling ceremony of “Changan-Huawei Joint Innovation Center” is held in Changan Automobile Chongqing Headquarter. Zhu Huarong, President of Changan Automobile, Li Wei, Executive Vice President of Changan Automobile and General Manager of Changan New Energy Technology Co., Ltd., Tan Benhong, Executive Vice President of Changan Automobile, Xu Zhijun, Rotating Chairman of Huawei, and He Liyang, General Manager of Huawei Automotive Industry Solutions Department, attended the event. This time the strategic cooperation is enhanced and the two sides will jointly create a new car ecosystem. Both sides will cooperate more comprehensively and deeply in more than 10 forward-looking technologies such as Level-4 autopilot, 5G car networking and C-V2X to provide users with a more intelligent experience. In the new energy field, both sides will jointly build an internationally first-class, China's leading intelligent electric vehicle platform. 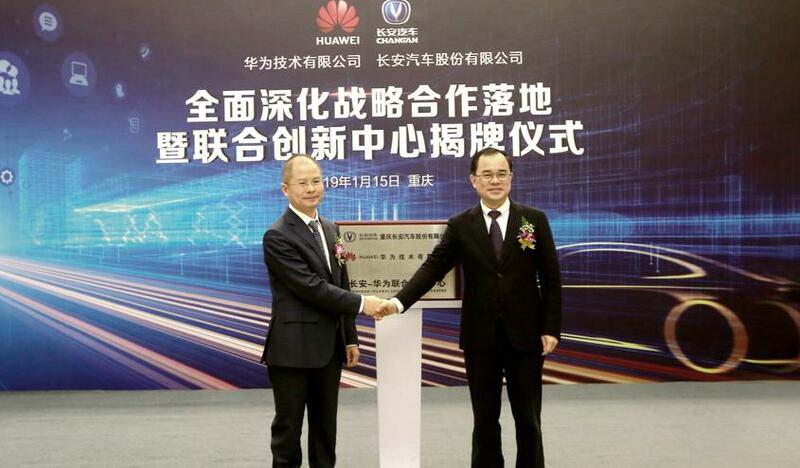 After the establishment of Changan-Huawei Joint Innovation Center, both sides will carry out in-depth technical research on the intelligentization, electrification, networking and sharing of automobiles to promote the far-reaching development of the automotive industry in the future. Faced with the continued downturn of the market, the uncertainty of the economic environment, and the challenge of the automotive industry's accelerated transformation into intelligentization and electrification, in 2018, Changan Automobile launched its third innovation and entrepreneurship program, which initiated the transition from traditional products to intelligent + new energy products. In the field of intelligence, Changan Automobile released the “Beidou Tianshu Plan”, as well as integrated global resources, and built three industrial clusters of intelligent driving, intelligent network and three-dimensional transportation to further promote the development of automotive intelligence. Also in 2018, Changan New Energy's "Shangri-La Partner Program" was officially launched to promote the fast development of China's new energy vehicles. This strong alliance not only vigorously promoted the third innovation and entrepreneurship process of Changan Automobile, but also promoted the transformation and upgrading of the automobile industry to intelligent and new energy and rapid breakthrough. We believe that in the future, Changan Automobile will integrate more excellent resources and accelerate the advancement of China's automobile industry.